As a child, were you fascinated by volcanoes, earthquakes, and landslides? Are you concerned about the effects of climate change and pollution on our planet? Do you want to help take care of the earth —and the people living on it? If so, Buffalo State College’s Earth Science Program may be the perfect path for you. Earth science is the study of the earth’s land, sea, atmosphere and solar system. Earth scientists study tectonically active areas to predict disasters; explore and discover areas that might contain oil, precious metals, or other minerals; monitor groundwater to make sure it is free of pollution; and investigate the strength of bedrock to support roads, dams, and tunnels. The field of earth science can take you anywhere —from the bottom of the ocean to the top of the Himalayas. Buffalo State’s earth sciences program helps students develop a broad understanding of the earth as a dynamic, interacting system of land, sea, atmosphere, and solar system. Our program provides an authoritative background for students interested in pursuing careers as scientists or earth science educators. Students pursuing a bachelor of science (BS) degree in earth science will work with a faculty adviser to select one of three concentrations: earth science, environmental earth sciences, or geology. Individualized attention: Our small class sizes promote close faculty-student interactions and one-on-one assistance. Environmental Science: The environmental science minor is designed to provide a broad base of knowledge in the various natural science disciplines that compose environmental science. The minor gives students the background necessary to understand and evaluate complex environmental issues. Geology: The geology minor can strengthen a student’s employability. Candidates for this program may include science majors contemplating a future in geophysics or geochemistry, students in environmental fields with a geological aspect, and students who may wish to be involved in land use planning. Honors Program: The earth sciences honors program enables undergraduate students with outstanding academic potential to participate in earth science-related research. Working closely with a faculty mentor, students gain research experiences not offered by regular courses. 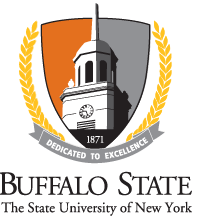 State-of-the-art facilities: Buffalo State offers two computer labs, planetarium, sediment lab with a flume and wave tank, environmental chemistry lab; structural geology, petrology, tectonics research lab; and more. Cool collection: A department collection of thousands of maps, labeled fossil specimens, rock specimens, and mineral specimens are available for student use. Buffalo State is committed to provide hands-on opportunities for students both in and outside of the classroom. The following clubs, internships, programs, and service learning programs are specifically aimed toward helping earth sciences students grow their skills. Field Education: Students have conducted fieldwork in such diverse locales as Hawaii, the American West (Grand Canyon, Bryce Canyon, and Zion National Parks), the Adirondacks, and Maine. Professional Conferences: Students can attend and present research findings at national and regional geology conferences with faculty members. Astronomy Club: Open to students with an interest in stars and planets, telescopes and planetariums. They hold meetings and social gatherings. Geology Club: This club open to all science students includes such events as fossil hunts, hosting fossil and mineral shows on campus and the Hamburg Fairgrounds, trips to the Geological Society of America Conference, movie nights, and more. Student majors are given many opportunities to pursue independent research under faculty supervision or an internship experience. Students may find additional information about undergraduate research possibilities from faculty members, and by visiting the Undergraduate Research Office. Research opportunities are available to students in the study of rocks, fossils, environmental issues, and geological processes. Faculty research provides additional opportunities for students to perform laboratory work and hands-on outdoor data collection.